Perched on a hilltop in Kansas City’s Village West shopping district, Chateau Avalon (913-596-6000, www.chateauavalonhotel.com) looks more like an English manor house than a hotel. And although it certainly is the latter, the luxurious ambiance and top-drawer service definitely put it head-and-shoulders above your typical boutique hotel. And then there are the rooms. Each of the 61 suites are decorated in a different theme — from a Tahitian tree house to Jesse James’s hideout, and everything in between. Access hasn’t been overlooked at Chateau Avalon either. Although steps grace the front entrance, there’s an accessible entrance on the right side, close to the accessible parking area. From there it’s just a short elevator ride up to the front desk. The accessible Roman Dynasty Suite is decorated in a rich Roman theme, with walls adorned with murals and arches that frame the bedroom alcove. The foyer features a long table, with stately red and gold brocade chairs at each end. And of course Caesar’s bust looks down on it all from a cozy nook perched above the foyer. 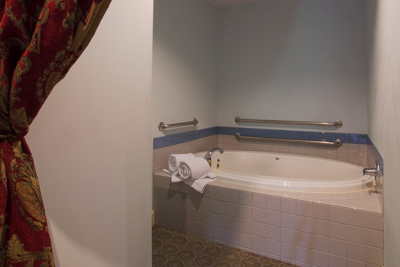 There’s good pathway access throughout the suite, which is furnished with an oversized jetted tub with grab bars, and a 30-inch high king-sized bed with wheelchair access on one side. 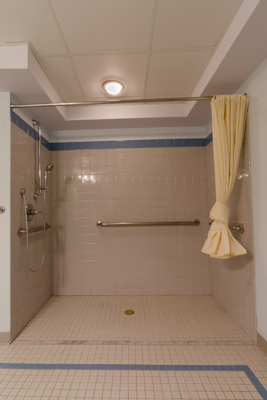 The spacious bathroom features a full five-foot turning radius and is equipped with a roll-in shower with grab bars and a hand-held showerhead. 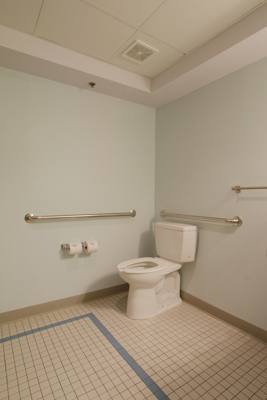 The toilet grab bars are on the right and back walls (as seated), and there is also a roll-under sink. 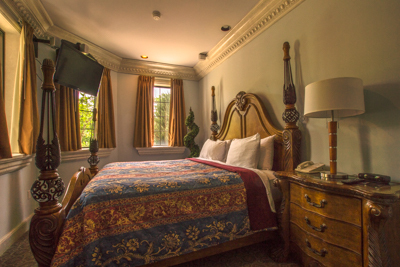 It’s a very luxurious and accessible room — who could ask for anything more? A made-to-order breakfast delivered to your room, you say? Yes, that’s included too. There is also good access to the first-floor d’Nile wine bar, and level access out to the adjacent patio. 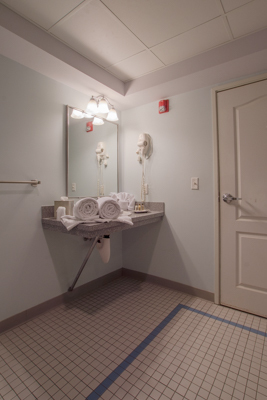 Additionally, the third-floor spa features barrier-free access; and the hot stone massage will simply melt away your troubles. It’s easy to see why Chateau Avalon has been dubbed “Kansas City’s most romantic luxury hotel.” It also gets a five-star rating for access and customer service. In short, it’s a great place to steal away and pamper yourself and your sweetie.